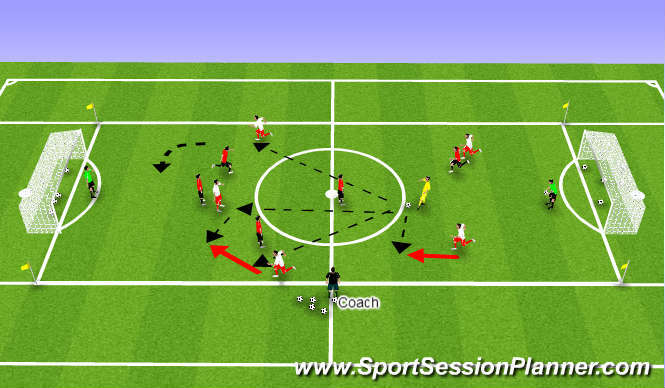 Objective: Red team must look to maintain possession in a 3 v 1 as long as possible while the defender attempts to "Win the ball back" and pass to either teammate on the outside. If the defender kicks the ball out of play, red stay in possession. Attacker who causes loss of possession remains in the middle as the defender. Based on level select amount of passes to = 1 point. Support- provide the right angle, right distance and correct timing. Movement- Into a position off the shoulder of the defender so he/she cant see the ball and the attacker at the same time. 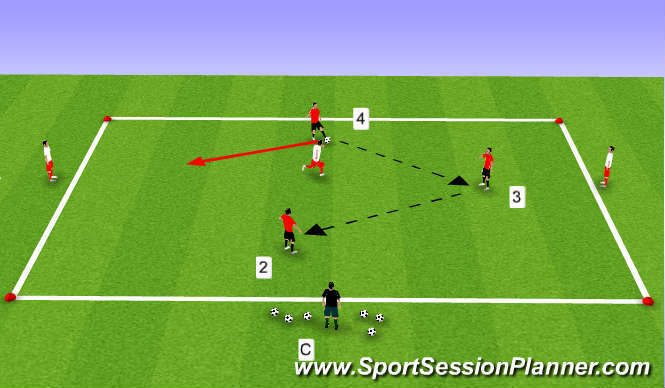 Objective: Red team must look to maintain possession in a 3v1 as long as possible while the defender attempts to "Win the ball back" and pass to teammate in opposite half. 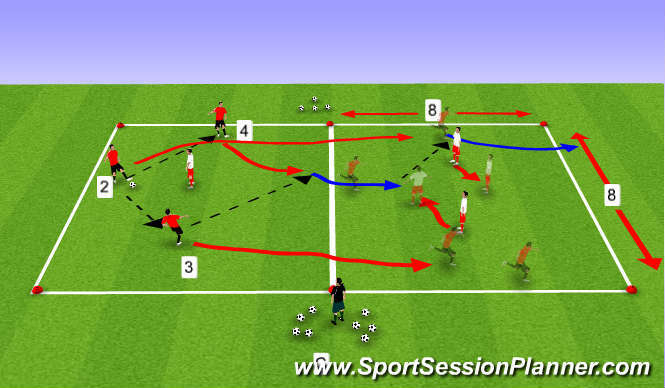 If the defender kicks the ball out of play the red stay keep possession by a restart from the coach. Attacker who causes loss of possession remains in the middle as defender. Once the team in possession have completed 5 successful passes they are now allowed to transition as a group into the opposite box to play 3 v 2, once in this area the objective is to look to get in behind the 2 defenders and score by crossing the end line with a dribble or penetrating pass.